user-generated Headlines and reports on this page = 3 news items. Page - 10. SOUTHPORT and Ormskirk Hospital NHS Trust is hosting a recruitment event for nurses interested in working at Southport and Ormskirk Hospitals. The open evening follows a number of successful events over the past 18 months and is an opportunity for newly qualified and experienced nurses to meet other nurses and team members, and discover what opportunities are available. Nurses wanting to return to practice are also welcome. Registered and student nurses should bring along identification as the Trust will be in a position to make conditional offers on the day. The event will be held at:- Southport Hospital Clinical Education Centre, on Wednesday, 22 November 2017, between 4pm and 7pm. Light refreshments will be available for all those attending. The Trust is offering nursing vacancies in both urgent and planned care. To view all current vacancies visit:- SouthportAndOrmskirk.NHS.UK. THE Bishop of Liverpool is encouraging more people to "know their HIV status" after taking an HIV test to raise awareness of National HIV Testing Week, that runs until 24 November 2017. Bishop Paul Bayes took the quick finger prick test to raise awareness of HIV and to encourage more people to take part in regular HIV testing. Figures show the number of people with HIV across Merseyside has increased during the last 12 years. In 2004, there were approximately 250 cases in Merseyside, but by 2016 this figure had raised to more than 1,041 patients. An estimated 101,200 people are living with HIV in England, with around 13% of these people not aware that they have HIV infection and are at risk of unknowingly passing on HIV. Late diagnosis still remains high in Merseyside acknowledging the need for testing. Bishop Paul Bayes took the HIV test at Liverpool based charity Sahir House, which provides care, support and practical assistance to people with HIV. He said:- "When I was asked to take part in this campaign, I was very glad to do so. I took the test because I believe that it will help our health as a nation if millions more people knew their HIV status for sure. Given the history of fear and stigma around HIV, I understand that people may be reluctant to be tested - but knowledge is the best way to destroy fear. Taking the test is easy and free, with the results back in minutes. It should become normal for all of us. The staff who dealt with me were lovely and completely put me at my ease. So if you have been putting this off I say 'Don't worry. Go, take the test, become sure of your HIV status, and face the future with confidence." HIV tests take just a few minutes to complete and can be done at the Royal Liverpool University Hospital's Sexual Health clinic and other centres across Merseyside. Mark Lawton, consultant in sexual health and HIV at the Royal Liverpool and Broadgreen University Hospitals NHS Trust, said:- "Knowing your HIV status helps you and others remain healthy. Testing is free and completely confidential. Rapid testing is also available which gives a result in just 20 minutes. Of the 6,095 people diagnosed with HIV in 2015, 39% were diagnosed at a late stage of the infection. People who are undiagnosed or diagnosed late have poorer health outcomes and are more likely to die prematurely, they are also more likely to pass on the infection to others." Tommy McILravey, chief exectuive officer of Sahir House, said:- "Dozens of people still die each year of HIV related illness. These deaths are preventable as there is treatment available to keep HIV in check. The sad thing is that the stigma associated with the virus stops people from finding out early enough. When high profile people like the Bishop take an HIV test it sends a powerful message. Knowing your HIV status should be 1 more thing you get checked regularly." Sahir House has been providing HIV support, information, training and opportunities to volunteer since 1985. For more information, visit:- Sahir.Org.UK, call:- 0151 237 3989 or call into:- Sahir House, second floor, 151 Dale Street. THE sporting City of Liverpool, the most successful footballing City, in England, home to both Liverpool and Everton and host of the legendary Grand National Horse Race, have been experiencing an increase in lower limb loss due to diabetes. In the period of 2013/14 to 2015/16, there were 78 major lower limb amputation procedures carried out on patients with diabetes in NHS Liverpool CCG, compared to 49 in the period 2010/11 to 2012/13. While Liverpool saw this rise, England overall saw a fall in these disabling, life changing surgeries. Diabetes is the most common cause of lower limb amputations. A person with diabetes is around 30 times more likely to have an amputation compared with the general population, and around 7,400 leg, toe or foot amputations can be attributed it each year in England. Since 1996, the number of people diagnosed with diabetes in the UK has more than doubled from 1.4 million to almost 3.5 million. There are also an estimated 1.6 million undiagnosed diabetes sufferers, bringing the total to 4.6 million people. That is 4.6 million people who are estimated to be up to 30 times more likely to have an amputation. A major diabetic lower limb amputation is above the ankle. Unlike a minor amputation; which may involve the removal of a toe and can be considered a preventative treatment; an above the ankle amputation often results in a poor quality of life can contribute to premature death. Many of these amputations are preceded by foot ulceration caused by a combination of impaired circulation and nerve damage; common problems suffered by people with diabetes. It stands to reason therefore that managing or even preventing these ulcers should reduce the need for life changing surgery and see more people with diabetes enjoying fuller lives for longer. Frank Webb, from the College of Podiatry, is a leader in the field of diabetic podiatry and his approach to preventing and managing ulcers could help in the fight to save the limbs and lives of people affected by this devastating disease which is becoming known as the biggest epidemic of the 21st Century. 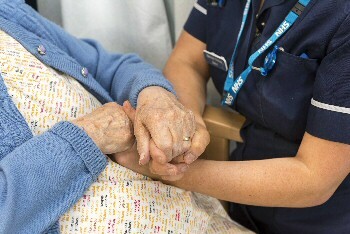 Pilot projects in the North of England have seen good results that use gold standard treatment strategies, rapid referrals to specialist diabetic foot teams incorporating multidisciplinary working, close collaboration between primary, community and acute providers and rapid access to specialist services; all in a community setting. Frank, who is discussing this approach at the College of Podiatry Conference in Liverpool this week said:- "Commissioners and service providers should ensure access to a foot protection service in the community and a multi disciplinary foot service team, but also need to think out of the box to ensure that the growing socioeconomic burden of diabetic foot complications are managed effectively and efficiently."